Need somewhere to hang your dog's lead after a walk? Why not try one of our lovely dog lead hooks. You will never misplace your dog's lead again, it will be kept safe on its own hook. 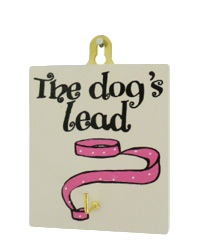 We have a great selection of dog lead hooks and some of which can be personalised with your dog's name and even painted with a unique portrait of your dog. If you need a place to keep your dog’s collar and lead safe, our fun dog lead hooks do just the job. Hand painted in the UK by Angelic Hen, each dog lead hook has a choice of fun colours or for something a little more unique, why not have a personalised dog lead hook with your dog’s name painted on the plaque. Our lovely designer at Scrufts has come up with a beautiful Heart and Hound Plaque that not only looks wonderful but can also hold all your dog’s collars and leads.